Several years ago (oh gee, time does fly), I wrote about tinting translucent polymer clay with alcohol inks. It’s a very effective way to make intensely colored polymer clay without losing the translucency. It’s also a simple way of creating colors for faux glass effects, and is the basis for three of the five projects in my Faux Glass Effects Tutorial. But is it the only way you can color translucent clay? As it turns out, no! You can use all sorts of pigments and paints and powders to color and tint translucent polymer clay. But do these all give the same results? Will they all be clear? No, they won’t. Here’s what happened when I tested 11 different art materials to explore coloring translucent Premo. What Can You Use to Color Polymer Clay? For some reason, there is much fear and confusion in the polymer clay world about the “compatibility” of various paints and art materials with polymer clay. Readers assume that something awful will happen if you mix acrylic paint or oil paint or chalks with polymer clay. You’ll even read where people will warn against it on forums and Facebook groups. But in practice, what can you use to color polymer clay? What works and what doesn’t? To find out, I started with a couple of bricks of Premo Translucent polymer clay and I used the art materials that I have on hand in my studio. I chose the closest color I could get to cobalt or ultramarine blue, for each of these materials. I was trying to eliminate color as a variable, so any differences would be due to the material. I just conditioned and sheeted the Premo and then spread some of the pigment on the clay, then mixed it in. I then made a #7 sheet with the tinted clay and cut out a circle. I wanted to see how strong each color was, so I tested the tinting strength by diluting the tinted clay 50/50 with fresh clay and cutting another circle. I did this to create 7 dilutions of 11 art materials and compared all the baked circles. In short, everything worked well to color translucent Premo. Every one of the materials that I added to the polymer clay mixed in thoroughly and gave good, though quite different, results. Nothing was “incompatible” or caused any stickiness or degradation or chemical problems of any sort. Some products (such as glitter) didn’t really color the clay as much as act like an inclusion. Others, (such as paints) colored the clay quite well. You can see the results below. Click to make bigger. Refer to the key above to see what the numbers mean. Note how some materials are more translucent. Also note how some have poor tinting strength and are not very blue at lower dilutions. In art materials, colors are created by either dyes or pigments. I discussed this subject thoroughly in my article Pigments vs Dyes, What’s the Difference. To summarize here, though, pigments are particles of ground-up colors that you mix into clay. And dyes are molecules of color that bind with the clay. 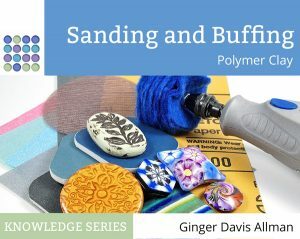 Because pigments can sometimes be made from fairly large particles which can block light transmission, it can mean that dyes are often better if you’re trying to keep the translucency when coloring translucent polymer clay. If you’ll notice, the large particles of the embossing powder, Pearl-Ex, and glitter seriously impede the translucency of the clay. You’ll also see how the pigments of the colored Premo, acrylic paint, and oil paint also reduced the translucency as compared to coloring with dyes. The surprise, to me, was how well the chalks colored the clay without blocking light transmission. When using paints, dyes, and other coloring agents, one of the most important factors is tinting strength. This refers to how strong a color is and how far you can dilute it. Cheap materials often have very low tinting strength and it takes a lot of it to get deep colors. In the case of inexpensive paints, there are often lots of fillers that are chalky and opaque. You can see clearly that the Craftsmart acrylic paint (a $1 bottle of paint from Michaels) is both chalky and it doesn’t stay very blue when diluted. You’ll also notice that the oil paint that I used has quite low tinting strength. In general, if color intensity is important, use the highest quality art materials that you can afford. Lower quality materials will have more filler and less color. It’s a misnomer that paints must dry first before being mixed in. Often they never dry anyway. And I never saw a problem with it. Chalky paint caused small air bubbles or plaques in the clay. Better acrylic paint did not have this. Dyes will often bleed through raw polymer clay. Store them without touching and know that canes and mokume gane made from dyed colors will bleed into each other over time. Mica, glitter, and embossing powder add interesting qualities other than color, such as sparkle, shimmer, or bubbles. Pan Pastels and high end chalk pastels give rich color. But cheap chalks and those not finely ground will not color evenly. They will look like colored sand in your translucent clay. You can tint translucent polymer clay with regular colored polymer clay, but be aware that you will likely lose the translucency. Most regular-colored clays have some opaque fillers, in addition to the pigments, that can make the result less translucent. It is a misconception (I believed it too!) that oil paints will degrade polymer clay. They generally will not. (This belief comes from the fact that some solvent-based paints and sealers remain sticky on polymer clay.) Regular artist’s oil paints are completely safe to be mixed in with polymer clay. However, that does not mean they’re the best material for making colored clay. The added oil of the paint can make your clay quite sticky…a bit like adding too much clay softener. Also, artist’s oil paints are expensive. You are far better off, financially, using alcohol inks to color translucent polymer clay than to use oil paints. The tinting strength is higher with inks and they’re cheaper. Plus, the colors of oil paint sets don’t seem to have good primary colors that mix to form clean secondary colors. See what happens when I mixed the red, yellow, and blue paints into polymer clay. They looked pretty good. But when I mixed the primaries together, the secondary colors (orange, purple, and green) weren’t very nice. The green in the center of this image is mixed from the Viridian Green paint included in the paint set. As you can see, these are not yummy colors for clay! Also, note, the red has almost no translucency. Alcohol inks or even acrylic paints would be a far better option as they’re inexpensive enough to get one in every color and not have to mix all your colors from primaries that might be muddy. Oil paints are good option for painting on the surface of polymer clay, but not the best things to get complete, smooth, flat coverage. Oil paints are an excellent medium for creating layered glazes and washes on polymer clay. Donna Greenberg and Doreen Kassel are two well-known artists who use oil paints on the surface of polymer clay with great results. Rather than mixing these art materials and colors in with polymer clay, what happens when you apply them onto the surface of the clay? In all cases, it is going to give you a very different effect. For example, here is what happened when I compared Pan Pastel applied to the surface of raw Premo vs mixed into Premo. See how the color mixed in is more intense, is easier to control the intensity (by dilution) and is more translucent. But also notice how the chalk applied to the surface of raw Premo gives a shaded look? They are totally different effects and will have very different purposes in your art. Some materials only work on raw clay and will not stick to baked clay without adding a glue or carrier of some sort. Pearl-Ex is an example of this. Every new material you use with polymer clay will affect it differently and you will have to do some experiments to learn the best way to get the effects you want. Be mindful when asking questions or giving advice in groups and forums about how to use these materials. For instance, a common question is “How do you use chalk with polymer clay?” One person may be thinking of using a fine dusting of red chalk to create rosy cheeks on an elf. Another person might be thinking of mixing the chalk in with the clay to get an intensely red translucent clay. Both are legitimate uses, but I have read people say that no, you can’t mix it in with the clay. Yes, you can! Do You Need to Seal DIY Colored Clay? So…you’ve used art materials to color your polymer clay. Do you need to seal it? If you have mixed something INTO polymer clay and then baked it, that color never needs to be sealed. You may choose to add a glossy varnish if you’d like, but it’s not necessary and you do not need to protect the surface in any way. In most cases, if you apply a color ONTO the surface of raw polymer clay it does not need to be sealed, either. Most materials bond quite well to clay during the curing process. But for glitters, embossing powder, mica powder, and chalks, you may want to apply a varnish or sealer for increased durability if the item is to be worn or used. Most paints do not need to be sealed. The exception to this is when paints scrape off easily. If your paint is scraping off, you do need to seal it. Here’s more information about Do You Need to Seal Polymer Clay. Can You Buy Colored Translucent Polymer Clay? So…what If you don’t want to make your own colored clay. Can you buy translucent polymer clay that’s already been colored? Yes, you can. Fimo, Cernit, Pardo, and PVClay all have a line of colored translucent clay. Read about (and see examples) of them here in my review of Colored Translucent Pardo Art Clay. You can see a few of the intensely colored Cernit translucent colors in my Review of Cernit. In general, if you’re going to be using a large amount of colored translucent clay, it is far more convenient to purchase pre-colored translucent brands such as these. But for smaller amounts and for convenience, you may prefer to color your own. Can You Color White Polymer Clay? Can you use these art materials to create colored clay from white polymer clay? It does seem to be an elegant solution. Just buy white clay and create all the colors you want. The problem is that white clay is…white. So no matter what pigment or dye you use, you’re always dealing with a mass of clay that has white pigment in it. So you will always have a pastel. (Red + White = Pink.) It takes a lot of paint or dye to get a very dark color of clay, and that gets expensive. It also changes the clay’s working quality, often making it sticky to work with and far too brittle after baking. Stick with buying pigmented clay, if possible. Coloring clay is a good trick to know, however. If you’re completely out of a color that you need, you can sometimes substitute some clay that you’ve colored yourself, especially if you only need a small quantity. But it’s not a practical method of consistently creating your own custom palette of clay colors. Also, newbies using Original Sculpey often want to add colors to it because it’s cheaper than buying colored bars of Premo or Fimo. Remember that Original Sculpey isn’t a very strong clay and you will weaken it further by mixing large amounts of color into it. It’s a false economy as you’ll be quite unhappy with the results. Just go for the good stuff and enjoy the higher quality of colored Premo and Fimo. 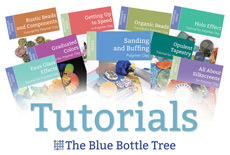 Want to Learn More About Polymer Clay? There are tons of articles here on this website that will help you learn more about working with polymer clay. Learn about baking, what’s the best clay to use, product reviews, how to make your own tools, working with molds, and MUCH more. Just click the picture below to go to a directory page with the most popular articles from this website. Have fun reading! As always, another super article. Do you know anything about using oil pastels? An artist friend just gave me some but I don’t know if they are compatible with polymer. I figured Ginger knows all! Oil pastels are a bit like chalk pastels suspended in sort of thick chap stick. So if you can make the pieces small enough, you can mix them into polymer clay. But you will end up with chunks. Which actually could have quite a neat effect. Certainly one for experimenting with! I say get out the clay and have fun. Just drag and highlight the part you want to print. Then in your print dialogue, there is is a tickbox for “print selection”. That way only the highlighted part will print. Thank you! I wonder why the chalks don’t opacify the clay – quite a surprise. I think they will if it’s low quality chalks. But Pan Pastels and higher-end artists pastel sticks are more pigment than chalk. So I think it gave better results than lower-end chalks would give. Great timing, as I have been tinting translucent liquid clay with both alcohol inks and chalk pastels this week. Fun stuff! Thanks for the info on the oil paints. I’ve read they weren’t compatible but you proved they are! Thank you so much. As always, you have been so thorough. Your photo charts are instant classics. Thank you for your hard work. You are such a leader! Well written and informative. Thank you! Terrific article! It had never occurred to me to mix chalk INTO the clay, I can’t wait to try it! I have a question: is it viable to use water based inks with polymer clay rather than alcohol? Excellent coverage of the topic. I agree with all of the positive comments above. You are a superb resource – a real go-to pool of knowledge. The polymer clay community really appreciates all your research. Thanks to everyone for your supportive and kind comments. It’s a really great feeling to know that what I’m putting out there is helpful and appreciated. You guys are the best!!! I have been noticing that there is a bit of buzz about using transparent glass paints for applications other than glass painting…. I’ve seen it used on canvas (which I have always done myself), and even used in a mokume recipe… now I am curious to know how it will work with translucent clay. I’ll let y’all know results if i can get to it soon…. or maybe another clayer here has tried it? Personally I use alcohol ink or pastels, but my pastel use was always on the surface after baking…. knowing that it can be mixed in opens up a whole new door… like making a very subtle skinner blend for a bead? C ya!! Thanks for the great article, Ginger. I just received a large block (1 lb.) so,will be experimenting with it and my pan pastels this weekend. Can’t wait to see the results! Wow! Thank you Ginger for sharing your hard work so freely. Your articles are so well-written and informative. You are an inspiration! I always love reading about your thorough experiments and findings… making your site a go-to reference place for what works and what doesn’t with polymer. Thanks so much for sharing your knowledge with us! What a thorough article Ginger – thankyou. Do you think Pardo Translucent would produce similar results ? Im about to start playing with Pardo and wonder if it the options for adding color are as broad as with Sculpey ? It should, and it will be even more translucent. Great information as always. Thank you for your research and sharing all your knowledge. So appreciated. Excellent article. You always figure out the questions to answer. Thanks again Ginger. Thank you for another well written, informative article. I love the humor you add now and again. You are so caring and generous and I know many people feel the way I do. Thank you Ginger …. you are the best. Really enjoyed your article, informative,creative and interesting. Appreciate your hard work and sharing.